A new 100-strong network of charging stations is being launched in Suffolk to provide the UK’s first ‘fully open’ public charging network. Dubbed ‘Plug in Suffolk’, the network is being run by EO Charging in partnership with Suffolk County Council and will see the charging stations – which will offer up to 400 individual sockets – be installed by local businesses across the county and made publicly available. Drivers simply pay by contactless payment with no need to register with networks or become members of organisations. Each charging location will be listed on www.pluginsuffolk.org or searchable via Zap Map and Google Maps. EO Charging is currently in discussion with a number of other counties and local authorities across the UK to launch similar projects. 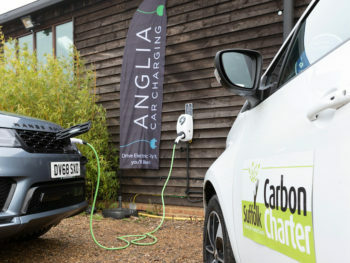 The project in Suffolk forms part of the county council’s ambition of Creating the Greenest County in the UK, and the first ‘Plug in Suffolk’ charging location has already been unveiled at Urban Jungle Plant Nursery and Cafe in Beccles. The company offers two 7kW EO chargers alongside the EO Pay kiosk. EO Charging has also partnered with green energy supplier Bulb to offer Suffolk businesses the opportunity to switch to 100% renewable electricity. Businesses that become a part of the ‘Plug In Suffolk’ network will be able to switch to Bulb, who provide affordable renewable energy at prices said to be on average 15% lower than standard energy tariffs offered by the ‘Big Six’.